1 of 5 Combine the milk and butter in a small saucepan. Place the pan over low heat until the butter melts, stirring occasionally. Remove the pan from the heat and let cool until lukewarm (110 degrees F). 2 of 5 Stir together the warm water and 1 tablespoon sugar in a small bowl. Sprinkle the yeast over the surface; let stand until softened, about 1 minute. Stir to dissolve the yeast. Let stand until mixture is foamy, about 5 minutes. 3 of 5 Combine 4 cups of the flour, the remaining sugar, the cinnamon and salt in large bowl. Add 4 of the eggs, the yeast mixture and warm milk mixture; stir with a wooden spoon until well blended. Stir in enough of the remaining flour to make soft but not sticky dough. 4 of 5 Knead dough on a lightly floured surface or in an electric mixer bowl with a dough hook until smooth and elastic, 8 to 10 minutes. Place the dough in a lightly oiled bowl, turning to coat evenly with the oil. Cover and let rise in warm place, away from drafts, until doubled in bulk, for 1 to -1/2 hours. 5 of 5 Punch down dough. Knead dough briefly. Cover; let rest for 10 minutes. Grease 2 large baking sheets. 1 of 2 Cut dough into 12 equal parts. Use one part for each bunny. If your kitchen is warm, keep unused portions of the dough, covered, in the refrigerator. Using one piece of dough, pinch off about 1/4 cup for the bunny body and roll into a ball, slightly elongating it into the shape of an egg. Place on one of the prepared baking sheets. Pinch off about 2 tablespoons dough and roll into a ball to form a head, elongating one end to a point. Dip the point in water and tuck under the body ball on the baking sheet to attach. Pinch off tiny piece from the original piece of dough for the nose. Roll into a ball, dip the bottom in water and place in center of face. Divide remaining portion of the original piece of dough into 6 equal pieces. Roll 4 pieces into balls for paws, making them slightly pointed and elongated at one end. Dip the points into water; tuck the points under the body on 4 places to make the paws. Roll remaining 2 pieces into logs for ears, making a point on one and flattening the other end of each log. Dip the flattened end of each into water and tuck under head for ears. Repeat with remaining 11 pieces of dough to make 11 more bunnies. Place the bunnies about 3 inches apart on baking sheets. Cover with plastic wrap; let rise in warm place, away from drafts, until doubled in bulk, 30 minutes to 1 hour. 2 of 2 Heat oven to 350 degrees F. Whisk together reserved egg and 1 tablespoon cold water in small bowl to make egg wash. 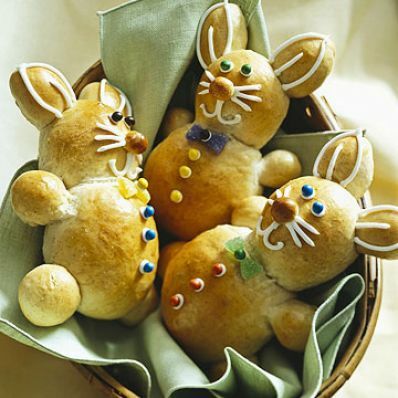 Uncover bunny breads; brush with egg wash. Brush each a second time. Bake in 350 degrees F oven for 15 minutes until bread is golden and sounds hollow when tapped with fingertips. Remove breads from baking sheets and let cool on rack. Cool completely before decorating. 1 of 2 Divide dough into 6 equal parts. Assemble as directed for small bunnies, doubling amounts of dough for body and head. Place the bunnies about 3 inches apart on baking sheets. Cover with plastic wrap; let rise in warm place, away from drafts, until doubled in bulk, 30 minutes to 1 hour. Brush with egg wash and bake in 350 degrees F oven 20 minutes or until bread is golden and sounds hollow when tapped with fingertips. Remove from baking sheet to wire rack. Let cool completely. 2 of 2 Tint batches of frosting with colorings. Spoon into pastry bags with small writing tips; decorate as desired. 1 of 1 Combine 2 teaspoons powdered egg whites with 2 tablespoons warm water in small bowl. Whisk 2 minutes to dissolve. Stir in 1/8 teaspoon cream of tartar. Beat with electric mixer until frothy. Add 1-1/2 cups sifted confectioners' sugar and beat until fluffy and stiff, about 5 minutes. If frosting is too stiff, beat in a few drops of water until frosting is proper consistency. Keep covered with damp cloth at all times or frosting will harden.